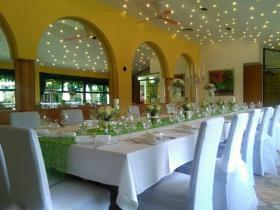 The steak house with terrace by the pond with carp also offers Mediterranean dishes from the buffet or à la carte. In addition to culinary delights, we offer you an extraordinary ambience. 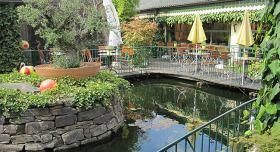 In summer and winter you have a beautiful view of our pond with waterfall from our restaurants Glocke - accommodated in a winter garden - as well as the Sonett - situated in the arcades. The gentle rippling of the water makes you forget all the stress of everyday life. The same applies of course to our terrace, which is open in the summer months and comfortably warm in the winter months. In our pond you can admire ornamental fish of various sizes and types. We are especially proud of our Koi's. To give the name "Glocke" a new realistic background, a carillon with an original Westminster chime and an old tower clockwork was mounted on the outer façade. In many areas of the interior decoration, the reference to the "bell" was also made to ring in the meal times. 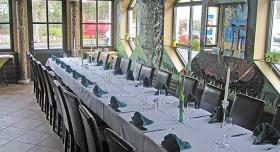 Today's "Glocke" is a modern restaurant with a Mediterranean ambience. All facilities are of the highest technical standard, integrated into a holiday atmosphere that is unparalleled in our region. A table reservation or the booking of a menu/ offer is in the "Restaurant Die Glocke" via GlobalGuest always for free you as a guest!